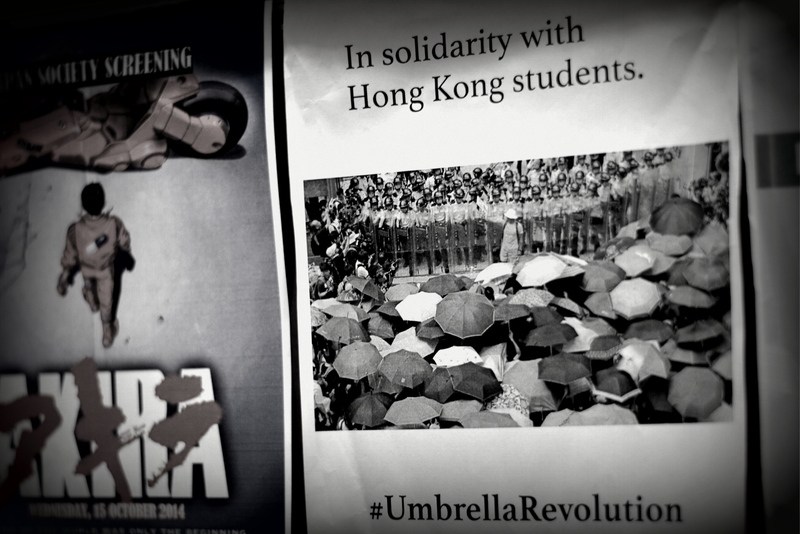 ￼The posters supporting Hong Kong’s Umbrella Revolution were reinstated in elevators within 12 hours. Early morning on Oct. 10, David Chia ’17 saw an official from the NUS Office of Housing Services (OHS) remove a poster reading, “In Solidarity with Hong Kong students” from a Yale-NUS elevator. The incident refused to leave his mind. “I felt like I should write something,” recounted Chia who posted about the incident on the Yale-NUS College Students Facebook group at 11.11 a.m.
Assistant Professor Dr. Jessica Hanser too felt “surprised” when she heard about the incident from a student at lunch. Earlier that week, she had given a lecture on markets to the freshmen for their Comparative Social Institutions class, where she referred to the situation in Hong Kong focusing on the economic aspects. Within minutes, the news of the incident spread like wildfire. Dean’s Fellows with access to the Facebook group immediately reported the incident to Kyle Farley, Dean of Students. As the administration gained further information, they decided that the best step would be to approach the OHS officials directly. Farley, Rector Brian McAdoo and Dean’s Fellow Sara Pervaiz Amjad promptly made a trip to the OHS. What students had feared to be a case of censorship, instead turned out to be a matter of miscommunication. Farley explained, “The miscommunication was that the person who worked [at OHS] thought the policy was that they should take it [the posters] down.”The community breathed a collective sigh of relief when Amjad clarified via a post on the Facebook group, liked by a third of the student body, at 2.25 pm that the removal had not been sanctioned by Yale-NUS administration and the posters should be put back up. The incident seemed resolved when the posters were back up on the elevator walls by late Friday night. However for many, the conversation had just begun. However, many students are still concerned. “Even if it was just a mistake, which I am inclined to believe…it still happened and I think that raises the underlying questions that have been there from the start… not about freedom of speech which is protected …but those questions about how Yale-NUS fits into… the broader NUS policy,” said Michael Moore-Jones ’17. Moving forward, students demand a more detailed and explicit written policy outlining all mediums of free speech on campus to ensure that such mistakes are not repeated.